Art Fund’s research, recently published in a report titled Calm and Collected – Museums and galleries: the UK’s untapped wellbeing resource?, investigated whether regularly engaging with museums and galleries could contribute to an individual’s sense of wellbeing, particularly focussing on the under 30 age group who are well-documented as being one of the most stressed generations. The study of 2,500 UK adults found that visiting museums and galleries as a way to ‘de-stress’ was consistent across all age groups, with 63% of UK adults having visited at some point to cope with anxiety or stress. Comparatively, of those who visit regularly, under-30s are twice as likely to visit monthly to de-stress (13%) than all UK adults (6%), suggesting the age group recognises the benefit of visiting museums and galleries on their wellbeing. Overall, Art Fund’s survey found that 65% of people under 30 felt some level of anxiety yesterday (a figure that is significantly higher than the national average 53%). Top sources of this anxiety stemmed from worry over debt and finances (49%), feeling lonely (48%) and anxiety linked to social media (32%). Further research by YouGov identified the top barriers to visiting museums, exhibitions and galleries cited by under-30s, with almost a third noting travel is too costly and time-consuming (32%) and lack of free time (32%) as reasons preventing them from visiting more regularly. 25% said that museums, exhibitions and galleries are too expensive. Art Fund, the national fundraising charity for art, has released a new annual art pass to help reduce the cost of visiting a museum, galleries and historic sites for under-30s. 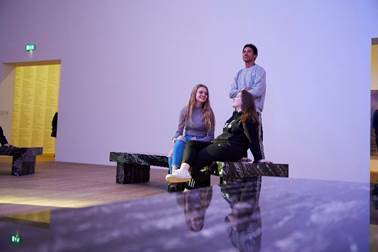 The Under 30 National Art Pass is available to anyone aged 30 or younger and offers free entry to over 240 museums, galleries and historic homes across the UK as well as 50% off major exhibitions such as the V&A’s forthcoming Christian Dior exhibition and Tate Liverpool’s Keith Haring retrospective. It is a specially discounted £45 version of its popular National Art Pass (from £70). Previously, Art Fund has offered an Under 26 National Art Pass; however, following research carried out at the end of 2018, the charity recognised a need to broaden its offer to the under-30 age group. The Under 30 National Art Pass is now available at artfund.org/national-art-pass for £45. ← Twin X A photography exhibition celebrating a decade of emerging creativity in London.